"Where is your patient group?" is the question that was asked of Teri Robert, chair of the American Headache and Migraine Association (AHMA) when she attended a meeting that the NINDS (National Institute of Neurological Diseases and Stroke, part of the NIH) invited a group of Headache and Migraine researchers and Teri to a meeting to discuss the need for increased NIH funding of basic Headache" research. Teri was invited to attend as an advocate representing all of us who live with Migraines, Cluster Headaches, NDPH, and other Headache disorders. NIH staff members pointed out that when one looks at the progress other disease states have made in garnering public and political support, there is inevitably a strong patient group that leads the charge. As they asked Teri, "If your patients don't care, why should we?" If one looks at organizations that have been successful in the past at advocating for their needs, garnering public support and understanding, and raising much needed funds for research, they virtually always have a strong patient group driving their efforts. After all, who can understand the need for these things better than the individuals who live with the disease day in and day out and their loved ones? The Susan B. Komen Foundation is made up of people who have been impacted by Breast Cancer and now has over 100,000 volunteers nationwide and raises over 400 million dollars a year. Yet, this organization did not even come into existence until 1982. It was founded because one woman wanted to educate others about the problem of breast cancer. If one looks at other diseases, including AIDS, colon cancer and Parkinson's Disease, they will see a similar pattern. In all cases, it is about those most affected by the disease banding together and having a collective voice. This is the bedrock for the development of the American Headache and Migraine Association (AHMA). It was the need for a collective, unified, and formal organization to represent those of us who live with Migraine and headache disorders that spurred Teri and the American Headache Society to form AHMA three years ago. As our mission statement reads, "Our mission is to help those affected by Migraine and other Headache Disorders find and use our voices to empower patients, family members, friends, and care partners. Through education, support, advocacy, and research we will bring hope and banish the feelings of hopelessness that too ofter accompany these disorders." There are well over thirty groups consisting of Migraine and Headache patients on Facebook alone. In looking at these groups, some of them have over 3,500 members. While this is a wonderful opportunity for those with Migraine and Headache disorders to interact in a social media environment, it just can't compare to the power that occurs when real people band together for a common cause. What is that common cause? If it is to share one anothers' burdens and have a place to talk about what is going with our Migraines and Headache disorders, then Facebook is the place to be. However is that all we want? 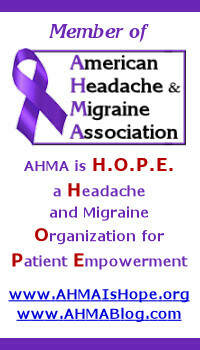 The things that I hear over and over again that Migraine and Headache patients want is better public education and understanding, more Migraine and Headache savvy medical personnel, increased funding for new and more effective treatments, medications specific to Migraines, Clusters and other Headache disorders, and a reduction in the stigma associated with Migraine and Headache disorders. Frankly, a Facebook page or even an online forum or webpage is very limited in being able to do these things. It will take a collective, visible and proactive effort on the part of those who live with these disorders. Our collective passion is the passion that will ignite interest in others. Just think of the influence AHMA could have in the next 25 years! Think of the changes that could take place in our world and our lives if we joined forces like some of the other active patient groups. Not only can AHMA be a source of support and education for patients, families and care partners, but it can be the driving force of a real and significant change in the way Migraines and Headache disorders are funded and perceived in the years to come. What if Teri had been able to point to a formal patient organization of over 3500 people when asked where our patient group was? Don't you think that would have gotten their attention? And what if our group had only 10% of the over 36 million people with Migraines alone? Can you imagine the things we could accomplish together?! For $15 a year - a little over $1 a month - every one of us with Migraines, Clusters, Hemiplegic Migraines, New Daily Persistent Headaches, Hemicrania Continua or one of the other hundred plus Headache disorders can be a part of something that has the potential of literally changing our lives. Today is the day to JOIN AHMA. If you have already joined, thank you. Now encourage your friends with these disorders to join. Let's band together and become change agents in our own lives. No more waiting on someone to take care of us. By standing together, we can be the change we want to see. Join Us for the 3rd Annual AHMA Conference on June 21, 2015.